"We decided to test our brain-to-brain interface by seeing if we could play a simple two-player video game. After students in our labs spent months writing computer code and integrating the technologies, on August 12 of last year we finally tried out our setup. Rao took on the role of the sender of information, and Stocco assumed the part of the receiver. "In the game, a pirate ship is shooting rockets at a city. The goal is to fire a cannon to intercept each rocket. Rao alone could see the screen displaying the game. But only Stocco could press the button to fire the cannon. At just the right moment, Rao had to form the intention to shoot, and a few seconds later Stocco would receive the intention and press the button. "Rao donned a tight-fitting cap studded with 32 electrodes, which measure fluctuations in electrical activity at different locations across the head. At any given time, distinct populations of neurons may be oscillating at many different frequencies. When he imagined moving a hand, the EEG electrodes registered a telltale signature that our software could detect. The giveaway was a drop in the low-frequency oscillations in Rao's brain. We used that signature as our cue to send a command over the Internet to stimulate Stocco's brain. "Stocco did not register the impulse consciously, but his right hand moved anyway. The stimulation caused his hand to lift, and when it fell it hit a keyboard and fired the cannon. Success! For the first time, a human brain had communicated an intention directly to another human brain, allowing the two brains to jointly complete a task. As we played the game, we got better and better, to the point where in our last run, we intercepted the pirate rockets with almost 100 percent accuracy. 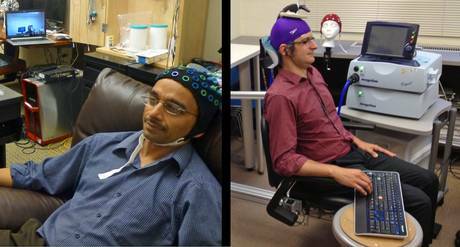 Rao learned how to imagine moving his hand in a consistent manner, giving the computer a chance to make sense of his EEG brain data. Stocco found that he did not know his wrist was moving until he felt or saw his hand in motion. "We have now replicated our findings with several other pairs of humans. 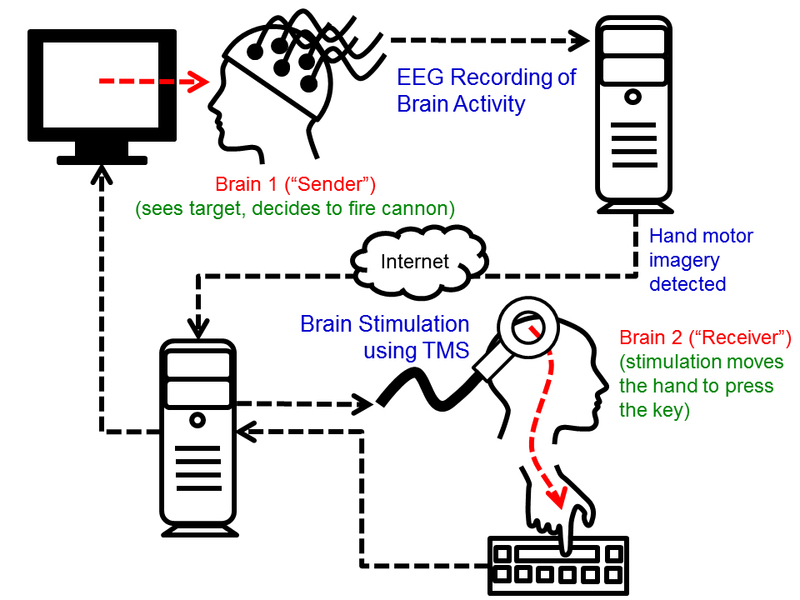 Not every trial went perfectly in these experiments, but in all cases, whenever an intention was correctly detected by the EEG system, the information was communicated directly to the receiver's brain using TMS. Throughout the experiment, both subjects were conscious of each other's roles and willingly cooperated to solve a mutually agreed-on task. When a pirate rocket gets hit, the sender knows that his or her partner's brain enacted a movement in response to the sender's own brain activity. We believe this conscious cooperation between subjects is the ultimate goal of true brain-to-brain communication, something that may be hard to achieve with animal studies."